Some years ago a violinist friend of mine, who had for quite a few years travelled the world with his string quartet, decided to move to the north Yorkshire dales. Thinking that he must somehow have lost his reason and be going through some sort of crisis of confidence, I planned my first visit with some trepidation. Why on earth had he chosen to put himself so far from civilisation, in, as I thought, some barren outpost of Her Majesty’s realm, where no one could possibly drop in by chance? From London the journey by road is long ( three and a half hours ) and, for the most part, boring ( motorway for most of the way ), but as I meandered along the last part of the journey, driving west after leaving the A1, something began to work its spell on me. And then it dawned on me. Maybe he had chosen to come to this place simply because of its beauty ? The largest centre near my friend’s home is Leyburn, a small Yorkshire market town that preserves its simplicity and charm without too many concessions to the twentieth century. But the surrounding countryside is wonderfully undisturbed by time, and so, I hope to God, it will remain . The combination of wild moorlands with the softer wooded dales is magical, and before long I found myself powerfully drawn to it, as a place of quietness, timelessness, and natural beauty unspoilt by the intrusion of man. Some short while after moving there, my friend told me that he had met a violin maker who lived near the next village, Middleham. A violin maker in this neck of the woods? What on earth is a violin maker doing in this place, so far from the potential customers he might find if he were near some metropolis or another, I thought, tripping myself up again, before I answered my own question with the obvious answer. As time passed and more information about him began to filter through, my curiosity was aroused. I had imagined that perhaps he was a retired maker, but on the contrary, it turned out that Roger Hansell was a young married man, with a family of three children. It also turned out that he was particularly interested in varnishes and the appearance of old instruments. He had studied as a painter at London’s Central School of Art and Design, but while there his interest in the craft of violin making had been awakened quite by chance. He had been sent one day to the Victoria and Albert Museum to look at some pictures, but having seen them all before , it was the collection of musical instruments that happened to catch his eye. That day was to completely change his direction and, ultimately, profession. That was interesting in itself, but when I first saw an example of his work, I was completely entranced. A fine old Italian violin which had a very damaged front had been brought to him. The scroll was not original and was not in keeping with the age and style of theinstrument, so Roger had made a new belly and scroll. The wood which he had used for the front, an eighteenth century floorboard from his own house, was roughly contemporaneous with the violin, but the quality of the work was quite staggering. Had one not known that this was his work, it would have been extremely difficult to tell that both modern parts were not the originals. For some time I had been thinking of having my Gofriller cello copied. In my work with the LSO, we often need a second instrument when the orchestra goes on tour and we still have engagements to fulfill in London. In addition there are times, when going to a very hot or humid climate, that I have often felt reluctant to take the Gofriller, for obvious reasons. It also seemed to make sense to have an instrument that would be as close in dimension and “feel” as possible, so that there would be as few problems as possible in swopping between them. The question of having an exact copy hadn’t really crossed my mind , but I knew that whatever instrument I bought or commissioned, I probably wouldn’t be happy with something that looked “new”. Of course I know that this is largely a psychological barrier, but it is curious how much it does affect the way one relates to an instrument. It isn’t a question of trying to fool other people, more a question of feeling that something obviously new is somehow out of time and sympathy with so much of the music we have to play. I have often found it strange that so many young makers feel it is an anathema to them to try to “age” the appearance of an instrument even slightly. After all, in making any string instrument it is a fact that we are only recreating the form of an object that reached its apotheosis three hundred years ago. It would be an incongruity for a cabinet-maker to make a copy of an eighteenth century commode that looked new, but in the case of violin making, curiously enough it is not considered a solecism to make a “new” Guarnerius! I realised that to commission a copy of my cello was quite a risky undertaking, and so, initially, I had the idea of asking Roger to revarnish a modern Japanese cello, which, though a decently made Montagnana model ( maker not known ), was a rather bland looking instrument. Roger was somewhat reluctant to do this, feeling,I think, not entirely happy about tampering with another maker’s finish. I had thought that it would give him a “dry-run”, as it were, but could also see that from his point of view it would be much less satisfying than making a complete copy of my own cello, and that time would be much better spent on making an instrument from start to finish. My first visit with the Japanese cello was in the summer of 1991, but it wasnt until almost another year later, in the Spring of 1992, that I plucked up my courage and took my Gofriller to Yorkshire for Roger to have a look, with a view to making the copy. Apart from looking carefully at the cello, Roger wanted to hear me playing the instrument, so that he could become familiar with the sound, and hearing him talk about sound really did make me feel that his ears were as open as his eyes. At that time it wasnt possible for me to part with the cello for any length of time, but Roger impressed on me that to get as much data as possible, both in terms of measurements and the whole “feel” of the instrument, he would need to have it for several days. In June 1992 Roger wrote to me accepting the commission and going over several points. He had started to think about researching other Gofriller cellos for comparison, and mentioned that he had a contact in America that would prove useful. I had toyed with the idea of having a slightly smaller copy made ( In width ), as I felt that this might be more comfortable to play, but Roger had dissuaded me, feeling that the point of copying would be negated unless it was carried out faithfully. Fortunately later that year, in July, I had a concert in Castle Howard as part of the Ryedale Festival. As Roger hadn't heard the Gofriller in a large space, he came to the rehearsal and I spent some time before the concert playing to him and trying to demonstrate the particular qualities of the instrument. I had a few days free following the concert during which I had decided to indulge my curiosity about silver-smithing ( having by chance found a teacher near Malton ), and Roger was able to relieve me of my cello for the requisite free days. During that time I believe that Roger made very detailed notes of all aspects of the instrument - its irregularities, repairs, wear marks, as well as all the technical information necessary to carry out the project. He made up a number of samples of the varnish colour and texture, and in addition photographed the instrument extensively, as “back-up”, though not wanting to rely on photographs as his main source of information. As luck would have it - though it didnt seem like it at the time - in 1991 I had had to have the Gofriller opened for a repair. 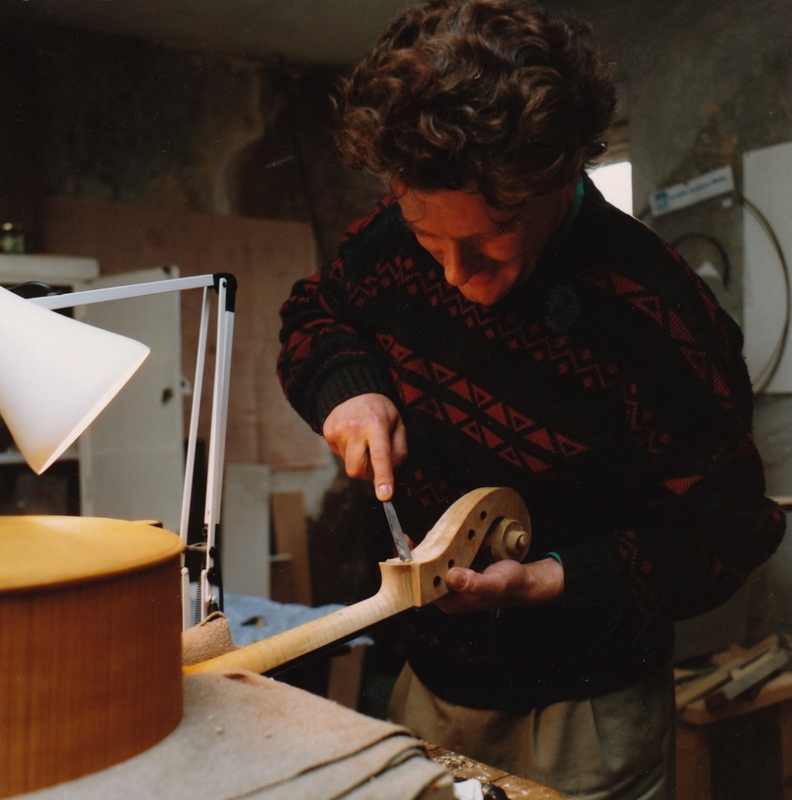 During the time it was open, Christine Marmy had taken extensive photographs of the inside of the cello, which were to prove of great value to Roger . All along, one of the things that really impressed me was Roger’s wish to become familiar with the sound and character of the instrument, both in a hall and a smaller space. I suppose I could say that I wasnt surprised by his painterly eye for detail in terms of proportion and appearance, but sound is another and more complex question. As we all know, talking about sound is extremely difficult, and it seemed that his concern was to try to establish a common language which would have some relevance for both of us, as the terms that we use to describe sound are so subjective. ( Not to mention the problem of the difference between the hearing of the sound close to the instrument, and the perception of it from some distance. ) His interest - almost obsession - with sound includes his Hi-Fi system,( part of which he has made himself ), to which he is constantly making adjustments and which reproduces sound of extremely high quality. The belly of the Gofriller has a very distinctive wide grain, and the first hurdle would be to find wood that matched as closely as possible the appearance, while at the same time having good acoustic properties. This necessitated a trip to Gleistner in Bavaria, where he found some vigorous pine in which the growth had produced particularly pronounced year rings. From the depths of the wood pile in the barn, and after much tapping and sounding, Roger unearthed the back wood - actually two good candidates were found, so the final selection could be left for a more prolonged examination in the calm of the workshop another day. 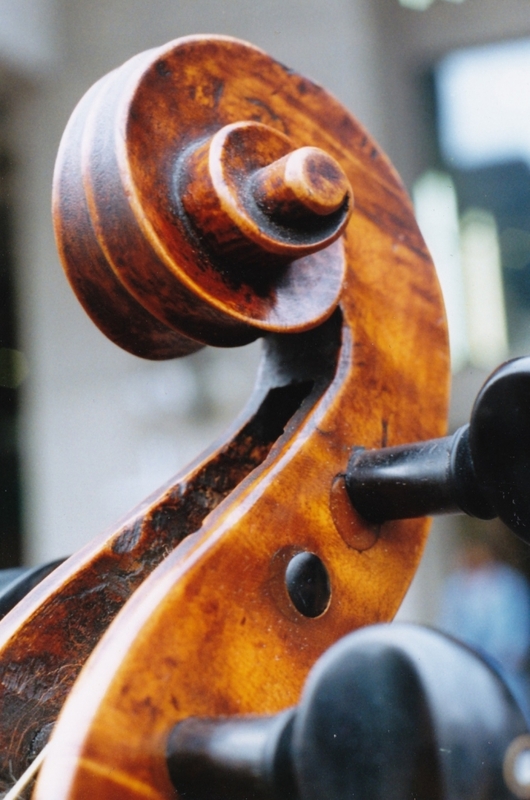 I had been very keen to see as much of the evolution of the cello as possible, from its earliest stages, as I have always been fascinated by the violin maker’s skill, and even, at one stage, did some making myself, sadly never managing to get time to complete an instrument! Autumn 1992. Completion of belly, back and ribs; I couldn’t wait to see how it was progressing, and Roger was able to bring the belly and back to London, as I had a very busy Autumn and couldn’t manage to get up to Yorkshire. The front of the original has added “wings” where presumably Gofriller had run out of wood wide enough, and these Roger had added in older wood taken from I8th century millbeams salvaged in Yorkshire. The ribs were a particular problem, not generally encountered in the making of a new instrument. This had a lot to do with not only the fact that time had lent its hand with some distortion, but also that the front and back are quite different in outline. Hence the ribs had somehow to meet both table and back and in order to do so they are extremely asymmetrical. Looking down the ribs from the scroll end of the Gofriller to the end pin, there is a wonderful variety of non-parallel lines, and in order to achieve this in the copy meant building the instrument in a free floating manner without the use of internal moulds and with only the occasional temporary bracing. In itself this is not so unusual, but the extent of the deformation required was something quite new, and is an integral part of the character of the original. February 26th 1993 London. The cello makes its first appearance in one piece - still in the white wood. I can hardly contain my excitement to see this pristine albino clone of my cello ! And to imagine that this was probably exactly what the Gofriller looked like when it was being made - a curious time warp. Fine details were still incomplete but the cello was roughty set up so that I could play it. The first meeting of bow on string caused a ripple of excitement - the feeling that one was bringing a sleeping princess to life! After a great deal of discussion about acoustical aspects of the sound, the cello goes back to Yorkshire for some rethicknessing of the table in the lower bouts, where Roger feels that the original has more “give”, and therefore more ability to vibrate. March. Roger makes another London visit. This time the instrument is really speaking and in its sound “kinship”, it feels like a younger brother to my Matteo! Other details that I notice: half-edging on the table and back; the ripple effect on the back,( which on the Gofriller has become pronounced as the soft and hard grain fibres have aged ); the facsimile label, on eighteenth century paper, printed in the same way as the original; and the hand-made pegs, and endpin fitting, both beautifully made to match the originals. Roger had previously set up a business making very high quality fittings (including boxwood pegs and tail pieces etc ), so the materials were all to hand. April 13th. I have a concert with the Nash Ensemble in Temple Newsam House, near Leeds, followed by three free days. The double temptation of going to see the cello, and doing some walking in the dales is too much! By this time the whiteness of the wood is changing to a more golden colour, thanks to some time in the ozone and ultra-violet light cabinet, and final work is in progress on the scroll. Perhaps feeling rather scrutinised by me, Roger hands me a chisel and says “Do some yourself!” Slightly taken aback, yet at the same time excited by the idea, I take the chisel and gingerley start to gouge the groove on the back of the scroll. Heart thumping, I keep thinking “He’s mad to let me loose on this”, but after some time, having experienced what it feel’s like being out of control with a sharp instrument in my hands, I happily return the chisel to Roger. This visit is also crucial in order to give Roger a chance to have the Gofriller again so that he can make more observations about the varnish, patches of wear and superficial marks, all of which will be incorporated into the final appearance. Arkengarthdale beckoned to me the next day. My God, what a place to live, with this on your doorstep! May 27th finds me back in Yorkshire again and this time the base coats of varnish are beginning to transform the youngster into an old man. Quite a lot of the damage marks are now evident, but again Roger offers me something that looks like a dentist’s probe, and invites me to inflict some more damage. Very conflicting feelings ! How can I possibly mark something that has taken so long to make and which looks so beautiful? Oh well, here goes! After making a few rather insignificant marks, I’m beginning to get a taste for this., and go for the deep track that a worm hole just below the surface leaves behind. I cant really believe what I’m doing, but encouraged by Roger, I feel I’m puting quite a lot of input into this! I cant help feeling that this is going to improve my “bonding” with this instrument! The next six weeks are largely devoted to work on the varnish. A particular concern was predicting the end of the process at the beginning. For the right crackling to occur spontaneously in later months, the scene had to be set with the earliest layers. The standard painter's dictum "fat on lean”, was for once turned on its head. The colouring. a mixture of lake and asphaltum, was manipulated carefully to reproduce the slightly bluish overtone seen in certain light. July 20th Almost a year after Roger first examined the Gofriller, its clone is ready ! Great anticipation, mingled with curiosity, anxiety - will I like it ? etc etc. The first sight is a shock - there it is sitting there mimicking the Gofriller, and I have to look twice to make sure that it really isn’t the real one - followed by disbelief at the verisimilitude of it. (I still have to look carefully when I open the case to make sure which is which! ) I can hardly believe that I can now actually take it away and play it! Whereas before it could be regarded as various separate components slowly coming together, now it was an entity in itself, existing in a new dimension, and had a voice ! Perhaps there is something similar in the craft of boat-building, where a vessel is made on dry land, but, no matter how beautiful it is will only fulfill its higher purpose when it meets a new element - water. I have to confess to a feeling of sadness that the making of the instrument was coming to its conclusion, because I find the actual process of gestation so fascinating - the mixing of the ingredients to make the cake ! The next, and probably even more complex phase, involved experimenting with the set-up, but I felt that I should simply try to “get to know” the cello first in order to have some basic idea of how it was working , so, after some minor adjustment I took it with me back to London. Two days later I began a week’s work with the LSO and crept surrepticiously to my chair with the Hansell-Gofriller. Three or four days later I asked my desk partner if he had noticed anything different about the sound I was making - he certainly hadn't noticed anything different about the look of it - but no, he hadn't. So far so good ! The cello’s first outing in a solo context came two weeks later when I was involved in the Haydn Concertante with the orchestra in the Daytona Festival. And since then, apart from using it regularly in the orchestra, I have done several concertos and solo broadcasts with it. As I felt I began to “know” its voice, I also experimented quite a lot with different set-ups to explore as many permutations as possible. Just as with an old instrument, one has to search to find ways in which the instrument feels as happy in itself as possible, and Roger has made various adjustments since its debut in an attempt to get the best out of the cello. I think it is extremely rare that a maker should demonstrate such a variety of skills as does Roger Hansell, and it has been a fascinating journey to be involved with and observe the “birth” of an instrument which is such a faithful copy of the original. Apart from anything else, in addition to aquiring this fine copy of my Gofriller, I have developed a passion for the Yorkshire dales which I imagine may outlast my ability to play the cello! It will be interesting to see how it ages, though I shall give someone else the pleasure of checking it out in three hundred years. Or perhaps, come to think of it , I can get myself cloned just in time to pop back and see how the cello is getting on.